Dr. Alfred “Tuna” Charles Snider, of Burlington, teacher, scholar and mentor of the University of Vermont debate team for over 30 years, died December 11. He is survived by his wife, Bojana Skrt; daughter Sarah Jane; son-in-law Justin Matthew Green; and grandsons Jackson Matthew and Levi Martin Green. He also left a sister, Janet Hermanaeu; his nephew, Will Wilson, and wife Amy Wilson and their children Annie, William, Rachael, Jacob; his niece Sarah Wilson and her children Katie, Allie, Anna, Maddie and Johnny; his niece Linda and her child Dakota; and his former wife, Sally Zitzmann. Dr. Snider led the University’s Lawrence Debate Union for more than three decades, taking the student team to international acclaim. UVM currently ranks 15th in the world among academic teams in the International Debate Education Association alongside distinguished debaters from Yale, Cornell, Oxford, Cambridge, and the London School of Economics. Since 1984, Snider served as director of the World Debate Institute and conducted formal debate training in 35 countries. He trained debaters from over 40 nations at the World Debate Institute’s sessions in the USA, Korea and Slovenia. He directed debate programs at international conferences in Palestine, Iraq, Turkey, Estonia and Qatar, among others. Dr. Snider wrote over fifty scholastic articles and five books about debate. He was a beloved professor. In the pursuit of greater knowledge, Tuna taught Communication, Civic Engagement, Persuasion, Rhetoric of Ivan Illich, African American Rhetoric, Presidential Campaign Rhetoric and the very popular Rhetoric of Reggae Music. Dr. Snider also had a huge impact on the Burlington community. Between 1984 and 2002, Tuna cofounded the Vermont Reggae Festival and graced the stage for years as the master of ceremonies. For over 15 years he hosted the “Reggae Lunch” radio show on WRUV 90.1 FM. They will honor him on Wednesday, December 16, 8-10 p.m., with a tribute show. Dr. Snider won the 2008 Director of the Year (VCAM) for his television program "Flashpoint" — with nearly 500 episodes, with panels discussing relevant political and social issues. 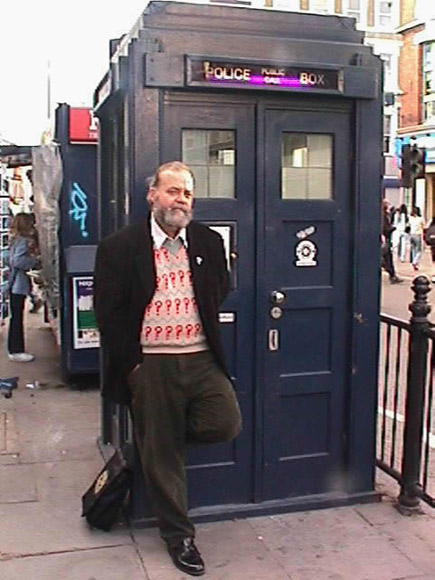 Dr. Snider was also an enormous "Doctor Who" fan and hosted "Doctor Who" Theater every Monday night for the last 16 years. Tuna cultivated a strong community of leaders committed to social justice, and there is no doubt they will continue his legacy. Travel spirits be kind! A memorial service will be held Friday, April 29, at 4 p.m. at the Ira Allen Chapel. There will be a reception immediately following.